Increasing motorization worldwide has brought more crashes and injuries to vehicle occupants, particularly in low- and middle-income countries. One of the most effective measures to protect occupants from injury in the event of a crash is the fitment and use of seat-belts and child restraints. Restraints save lives and reduce injury severity - all vehicle occupants should be appropriately restrained when travelling in a motor vehicle. Failure to use a seat-belt is a major risk factor for road traffic deaths and injuries among vehicle occupants. Passengers who do not wear seat-belts and have a frontal crash are most likely to suffer a head injury. It should also be noted that the financial burden of increased death and injury severity can have a major impact on the finances of the government and local communities who deal with road crash victims and their families in the aftermath of a crash. Rates of seat-belt use vary greatly between countries, governed to a large extent by the type of laws that require seat-belts to be fitted in vehicles and cars, and the laws requiring them to be worn. In many low-income countries there is no requirement for belts to be fitted or used, and rates of use are therefore correspondingly low. For many of these countries there is significant potential for improvement in wearing rates of seatbelts and child restraints. A review of research on the effectiveness of seat-belts found that their use reduces the probability of being killed by 40–50% for drivers and front seat passengers and by about 25% for passengers in rear seats. A study in Norway calculated that head injuries make up some 60% of all injuries to vehicle occupants. The study concluded that drivers and front seat passengers who do not use seat-belts suffer almost the same percentage of head injuries as non-users in rear seats. Ejection from a vehicle is one of the most injurious events that can happen to a person in a crash, with 75% of all vehicle occupants ejected from a vehicle in a crash dying as a result. Seat-belts are effective in preventing ejections: overall, 44% of unrestrained passenger vehicle occupants killed are ejected, partially or totally, from the vehicle, as compared to only 5% of restrained occupants. Seat-belts are approximately 50% effective in preventing fatalities in crashes in which motorists would otherwise die. It is estimated that seat-belt use prevented about 15 200 deaths in the United States in 2004. If all passenger vehicle occupants over 4 years of age in the United States had used seat-belts in 2004, nearly 21 000 lives could have been saved (that is, an additional 5800 lives). A review of various United States studies has shown that child safety seats that are correctly installed and used for children aged 0–4 years can reduce the need for hospitalization by 69%. The risk of death for infants is reduced by 70%, and that for children aged 1–4 years by 47–54%. Of children aged under 5 years, 485 lives could have been saved in the United States in 2002 if all the children had been in child safety seats. It has been estimated in the United Kingdom that new rules on the use of child restraints rather than adult seat-belts for children up to 135 cm in height or aged 12 years and above will save over 2000 child injuries or deaths every year . It is estimated that within the European Union seat-belts currently reduce driver fatalities by 40%. Wearing rates in European countries vary widely from around 70% to over 95%. If all European Union countries were to achieve a 99% wearing rate for drivers, 2400 lives would be saved each year. In many high-income countries the use of child restraints is common – with usage rates up to 90% – but in other countries they are still rarely used. prevent injury to other occupants (for example in a frontal crash, unbelted rear-seated passengers can be catapulted forward and hit other occupants). The actions of rear seat passengers can affect both injuries that they themselves might incur and those that may be sustained by the driver or front seat passenger. An unrestrained rear seat passenger poses a serious threat to any restrained person seated directly ahead of them. A belted occupant will be kept in their seat and thus will reduce speed at the same rate as the car, so that the mechanical energy to which the body is exposed will be greatly reduced. Thus the use of seat-belts by rear seat passengers could not only reduce the likelihood and severity of injury to themselves, but also to drivers and front seat passengers. Airbags should also be seen as supplemental restraint systems, designed to add additional protection to seat-belts in (primarily) frontal crashes over 13 kilometres per hour (km/h). While airbags have saved many lives, there have also been deaths attributed to airbags deploying in crashes that would not have been life threatening. Analysis of deaths involving airbags in the United States showed that nearly all of the people who have died from airbag related injuries were either unrestrained or improperly restrained. Most of the deaths have been to children and adults of small stature. Airbags are a passive restraint system, deploying automatically in some types of crashes. If an occupant is unrestrained, or the vehicle has an airbag installed but no seat-belt, it is possible that the occupant may come into contact with the airbag before it has fully inflated. This is also the case for people who need to sit closer to the steering wheel as a result of their size. Airbags deploy at approximately 300 km/h. Therefore, vehicle occupants should ensure that they are restrained regardless of whether or not a vehicle has an airbag installed. It is best for small children to be sitting in a child restraint on the back seat away from airbags! In recent years seat-belts have become integrated into overall vehicle safety systems that include such devices as pretensioners, load limiters and airbags. The three-point lap and diagonal seat-belt is the safest and most commonly used in cars, vans, minibuses, trucks and the driver’s seat of buses and coaches, while the two-point lap belt is most commonly used in buses and coaches. Crash studies have shown that although the lap belt does fulfil the task of reducing ejection, it fails to prevent the occupant’s head and upper body moving forward and hitting the vehicle interior. For the driver, this could result in serious head injuries from contact with the steering wheel. However, because of the size and mass of coaches, the severity of injury when involved in a collision with another vehicle is often minor compared to that other vehicle if it is a car or van. Infants and children need a child restraint system that accommodates their size and weight, and can adapt to cope with the different stages of their development. The three-point lap and diagonal seat-belt used by adults is not designed for children’s varying sizes, weights, and the different relative proportions of children’s bodies. For example, a smaller portion of a child’s abdomen is covered by the pelvis and rib cage, while a child’s ribs are more likely than an adult’s to bend rather than break, resulting in energy from a collision being transferred to the heart and lungs. Consequently three-point lap and diagonal seat-belts may lead to abdominal injuries among children, and will not be optimally effective at preventing ejection and injury among them. Appropriate child restraint systems are specifically designed to protect infants and young children from injury during a collision or a sudden stop by restraining their movement away from the vehicle structure and distributing the forces of a crash over the strongest parts of the body, with minimum damage to the soft tissues. Child restraints are also effective in reducing injuries that can occur during non-crash events, such as a sudden stop, a swerving evasive manoeuvre or a door opening during vehicle movement. The safest place for children aged 12 years and under is in the back seat, properly restrained in an approved child safety seat. Specially manufactured child restraints should be used for children. There are three “collisions” that occur in every crash where occupants are unrestrained. The first collision involves the vehicle and another object, e.g. another vehicle(s), a stationary object (tree, signpost or ditch) or a human or animal.  The second collision occurs between the unbelted occupant and the vehicle interior, e.g. the driver hits his chest on the steering wheel or his head on the window. Finally, the third collision occurs when the internal organs of the body hit against the chest wall or the skeletal structure. It is the second collision that is most responsible for injuries, and can be reduced significantly by the use of seat-belts and child restraints. The most frequent and most serious injuries occurring in frontal impacts to occupants unrestrained by seat-belts are to the head, followed in importance by the chest and then the abdomen. Among disabling injuries, those to the leg and neck occur most frequently. When a crash occurs, a car occupant without a seat-belt will continue to move at the same speed at which the vehicle was travelling before the collision and will be catapulted forward into the structure of the vehicle – most likely into the steering wheel if they are driving, or into the back of the front seats if they are rear seat passengers. Alternatively, they can be ejected from the vehicle completely. At birth, the infant head is around a quarter of their total length and about a third of their body weight. An infant’s skull is very flexible, so a relatively small impact can result in significant deformation of the skull and brain. The smaller the child, the lower the force needed for injury. The infant rib cage is also very flexible. Impact to the chest can result in a large compression of the chest wall onto the heart and lungs, and some of the abdominal organs. The infant pelvis is unstable and cannot withstand the forces from an adult restraint system. 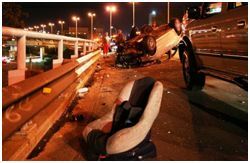 Infants require their own special seat designed to cradle them in a crash, and provide protection from many types of crashes. Like adult seat-belts, child restraints in cars are intended to keep a child firmly secured in their seat so that in the event of sudden braking or collision the child is not thrown against the car interior or ejected from the vehicle. The restraint must absorb kinetic energy (created by the motion of the child during the crash) without itself injuring the child and must be easy to use. There are a number of different types of restraints - The main determining factor for choice of a child restraint is the child’s weight. Older children who are above the height and weight specifications for using child restraints require a properly fitting three-point lap and diagonal seat-belt when riding in a vehicle. It is also important that child restraints be used correctly – If a child is restrained in the wrong system for its age or weight, or the straps or harnesses are not adequately secured or entirely left undone, it will place the child at an increased risk of both fatal and non-fatal injuries. Always follow the manufacturer’s instructions when installing a restraint and placing your child in it. The size and weight of your child. If the restraint will fit in your vehicle. The child should be kept in the most appropriate restraint suitable for his or her size and age and only be moved to the next category of restraint when he or she no longer physically fits. Never carry your child in your arms or share your seat belt with your child. In a crash you won't be able to hold on to your child. He or she may be thrown around the vehicle or thrown out of the vehicle. The safest way for an infant to travel in a vehicle is in the rear facing position. A rear-facing child restraint system (sometimes called an “infant car seat”) provides the best protection for infants until they are 1 year of age. Keep them in this position for as long as possible and only move them to a forward facing child seat when they no longer fit in the rear facing position. The bone-forming process is not complete until the age of 6 or 7 years, and throughout childhood a child’s skull remains less strong than that of an adult. A restraint system needs to limit forward head movement in a frontal impact and provide protection from intrusion in a side impact. A child restraint should therefore distribute the crash forces over as wide an area as possible. Belts and harnesses need to fit well and be properly positioned as designed by the manufacturer. The restraint system should also provide protection from contact with the vehicle interior in both front and side impacts. 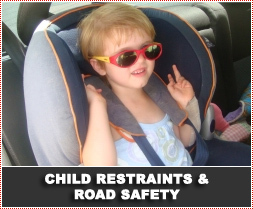 The best type of child restraint for young children is the child safety seat. The integral harness secures the child and spreads the crash forces over a wide area. This seat will last them until either their weight exceeds 18 kg or they grow too tall for the height of the adjustable harness. Booster seats are best used only when a child has outgrown a safety seat. They are designed for weights from 15 kg to 25 kg. Children should continue to ride in a booster seat until the lap and diagonal belts in the car fit properly, typically when they are approximately 145 centimetres (cm) tall. Booster seats raise the seating position of the child so that the adult seat-belt lies properly across the chest, crossing diagonally at the child's shoulder rather than the neck, and low across the pelvis. If the adult belt is too high across the stomach, in a crash serious internal injury could result, or the child could submarine under the seat-belt. The booster seat has a back and can provide some protection in a side impact. A booster seat can improve the seat belt fit when your child is too big for a forward facing child seat and too small for an adult belt. As a general guide, buy a rigid booster seat with a back, side wings and a sash guide to keep the seat belt in place. Booster cushions without backs are designed for weights from 22 kg to 36 kg, but manufacturers are now producing booster cushions with backs that cover the full 15 kg to 36 kg range. Shield booster seats, which have a plastic shield in front of the child, offer less protection and should not be used. It should also be noted that although children are best protected when secured in age appropriate child restraints, if such restraints are not available, it is still better to use an adult seat-belt on the child than leave the child unrestrained on the back seat. 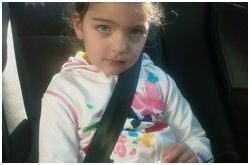 Once your child’s eyes are level with the top of the back seat of the car or the child is approximately 26kg or over, they may use a seat belt. The seat belt, however, must fit your child correctly; ie the lap belt is low over the bony part of the hips (not the stomach) and the sash does not touch their face or neck when all slack is removed. When using an adult belt, either alone or in conjunction with a booster seat, do not allow your child to place the sash portion of the belt under their arms or behind their back. Never use a booster seat with a lap only belt alone. If you are purchasing or borrowing a second-hand restraint, be VERY CAREFUL. Only use a restraint when you know its history or if it has been obtained from a reliable source. Do not buy or use it if it has been involved in a crash, has worn straps, bent or worn buckles, or the attachment points in the plastic shell are cracked or discoloured, for example from age or over exposure to the sun. In countries where car use is rising most rapidly, the use of seat-belts and child restraints is low. As child restraints are not installed within vehicles like seat-belts but must be purchased and fitted by parents it is more challenging to achieve high usage rates, especially in low- and middle-income countries. Comprehensive programmes of legislation, law enforcement, public education and publicity are needed to promote the benefits of seat-belt and child restraint use and to ensure compliance once legislation is in place. Such campaigns may focus on young people, and can be used both to increase awareness and to help make wearing seat-belts a social norm. Community projects can also employ parents and peers to encourage young people to wear seat-belts. We will be failing our children by not enforcing laws on child restraints and by not teaching our children to buckle up. Buckling up is the simplest way to save the lives of child passengers - let us wear child restraints and seatbelts at all times. 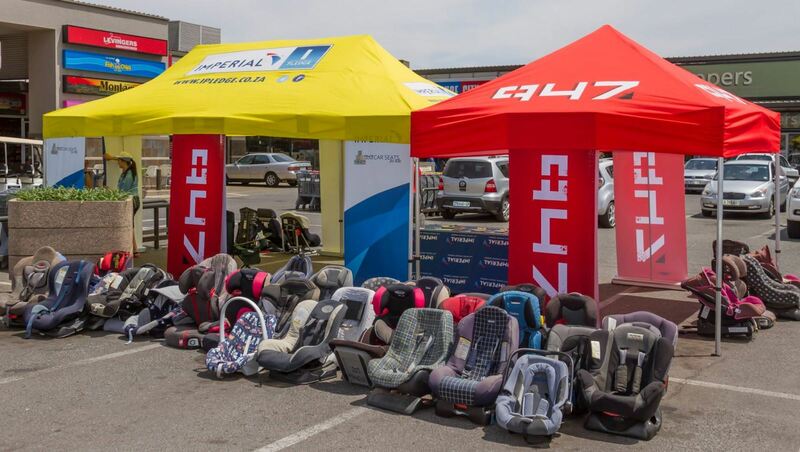 Our Organisation is launching "Child safety in the Vehicle" on the 24th February 2012 and invite families with an income lower than R7500.00 to apply to receive a child safety seat. Should you have a safety seat in you garage or store-room, please donate it to us and help us save a child's life. Contact us on 021 785 7656 or 081 311 3223 or email us on info@drivemoresafely.co.za. It will be effective from 30 April 2015. It was published in the 22nd National Road Traffic Amendment on 31 October 2014. The date was set in a correction notice to the legislation a few days later. (c) an infant is a person below the age of three years. (2) Any reference to a safety belt in these regulations shall be construed as a reference to a seat belt. (3) (a) Motor vehicles which are required to be fitted with seatbelts in terms of the relevant requirements as contemplated in regulation 216, shall be fitted with seatbelts in accordance therewith. (b) In addition to the requirements of paragraph (a), no person shall operate a minibus the gross vehicle mass of which exceeds 2 500 kg, unless seatbelts are fitted to the space on the front seat occupied by the driver, and if such front seat has seating accommodation for passengers, unless seatbelts are fitted for the driver and at least one passenger. (c) No person shall operate a motor vehicle on a public road unless the seatbelts fitted to such motor vehicle are in good working order. (d) Seatbelts fitted to a motor vehicle may only be removed for repair or replacement purposes and such motor vehicle may not be used on a public road while such seatbelts are being repaired or replaced. (e) In addition to the requirements of paragraph (a), no person shall operate a minibus or midibus, first registered after 04 September 2006,operating in terms of an operating licence, unless seatbelts are fitted for every seat in the motor vehicle. (f) the belt configuration for a seat in the rear of a motor vehicle shall be a 2-point belt or a 3-point belt, with anchorages in accordance with SANS 1430 : Anchorages for restraining devices in motor vehicles", and installed in accordance with SANS " 10168: Installation of safety devices (Safety belts in motor vehicles). (4) No adult shall occupy a seat in a motor vehicle operated on a public road which is fitted with a seatbelt unless such person wears such seatbelt: Provided that the provisions of this regulation do not apply while reversing or moving in or out of a parking bay or area. (5) No adult shall occupy a seat on a row of seats in a motor vehicle operated on a public road which is not fitted with a seatbelt, unless all other seats on such row which are fitted with seatbelts, are already occupied. (b) if no child restraint is available, wears the seatbelt if an unoccupied seat which is fitted with a seatbelt is available. 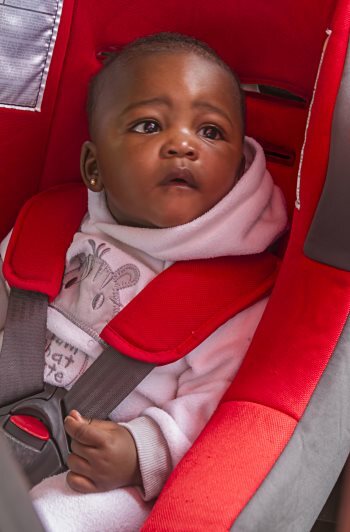 (6A) The driver of a motor vehicle operated on a public road shall ensure that an infant traveling in such a motor vehicle is seated on an appropriate child restraint: Provided that this provision shall not apply in a case of a minibus, midibus or bus operating for reward. Ø Reg 213 (6A) will be in force as from 30 April 2015. (7) If no seat, equipped with a seatbelt is available in a motor vehicle the driver of the motor vehicle operated on a public road shall ensure that a child shall, if such motor vehicle is equipped with a rear seat, be seated on such rear seat. (8) (a) A seatbelt shall comply with the standard specification SABS 1080 “Restraining devices for occupants of adult build in motor vehicles (Revised requirements)” and bear a certification mark or approval mark. (b) A child restraint shall comply with the standard specification SABS 1340 “Child restraining devices in motor vehicles” and bear a certification mark or approval mark. (9) The MEC may exempt a person from the provisions of this regulation on such medical grounds and under such conditions he or she may deem expedient. (10) An exemption from wearing a seatbelt in a prescribed territory shall be deemed to be an exemption in terms of subregulation (9) for the period of validity thereof. (11) The driver of a motor vehicle shall ensure that all persons travelling in such motor vehicle shall wear a seat belt as contemplated in this regulation. KFM and Imperial challenged citizens to help us keep our most precious road users safe! With these contributions it was possible to collect more than 500 car seats!